Round 2 - Game 4 - The Force Be With Him. And by "him" I mean Geno. So much for all that "Where's Geno" talk. He stepped up in game 3 like no one else has in these 2009 NHL playoffs. Thing is, we need it again. 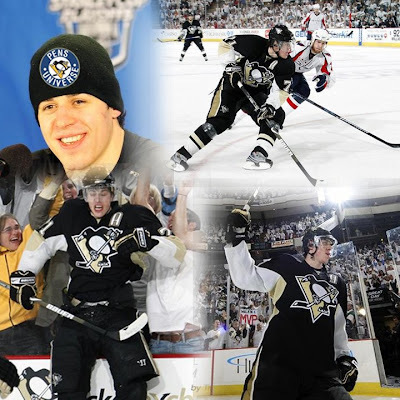 Pens fans everywhere are hoping The Force will be with Him the same as last game. This game is almost as important as the last. Sid himself said it correctly, the Pens are still playing with desperation on their minds. Why? Going down 3-1 headed back to Washington the very next day doesn't bode well with anyone in the Pens organization. And if you can tie the series up 2-2 and carry the momentum with you into the very next game, well, you can have a 3-2 lead back to the 'burgh. - Rumor has it Semin is out tonight. I'd be okay with that. - Download Mike Lange's call of Letant's OT winner here. So what are the keys to winning tonight? Offensive Intensity: First and foremost the Pens need to continue this offensive intensity. In game 3 the Pens literally stuck it to the Caps in every way possible. They rushed through the neutral zone on long passes; they attached the slot; they kept the puck in the Caps zone. Two-Headed Monster: Not that the role players are key, but when Sid and Geno take over the game it seems just that much easier for the rest of them. Defensive Pressure: There were very few easy chances for the Caps in game 3 and that's all due to Gill, Eaton, and Scuderi all stepping up. Target Ovechkin: Not like that 17 year old. Rather as they have done. "Put a body on him!" A quote that resonates through several sports. He is their greatest weapon and in essence their only "real" scoring threat. Keep him scoreless, your chances of winning greatly increase. Win Faceoffs: Still something that needs to be worked on as seen from here. But nevertheless the more we win the less opportunities the Caps have off the draw. Seeing I'm not much of a pregame guy and more of a postgame guy, I'm going to leave my thoughts for later tonight. We definitely need to get that first goal and early to shake Varlomov's confidence a little. We do that and keep up the intensity like you say we'll have a good game.